During 1967’s so-called Summer of Love, the Zombies began recording what would be their defining work, the critically-acclaimed album Odessey and Oracle [sic]. But on its release, the record performed disappointingly on the charts in America as well as in the band’s native England. “When we recorded it, there was no commercial success with this album at all,” recalls vocalist Colin Blunstone. 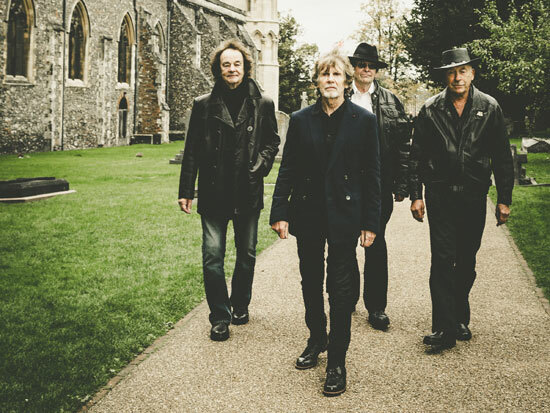 The Zombies would soon break up, having never toured in support of the album. That could have been the end of the story for the Zombies. Its two leading members – Blunstone and keyboardist Rod Argent – would go on to successful solo careers, while the band’s other members followed their own (sometimes non-musical) paths. But all remained on good terms; unlike many other rock groups, the Zombies didn’t dissolve in acrimony. The seeds of a reunion were planted 17 years ago, says Argent. “Colin and I got back together around the year 2000, but we only ever meant to do half a dozen gigs for fun.” But those shows in Great Britain were successful, and momentum began to build. The next step was to try an American tour. That would initially prove more of an uphill climb. While they drew large and enthusiastic crowds in New York City and Los Angeles, Argent says that “as soon as we got outside of the posts, we played for just handfuls of people. But we built that up, same as we did in the U.K.” Songs from Odessey and Oracle – especially “Time of the Season,” a hit single more than a year after its 1968 release – were among the most popular in the reactivated group’s set. Argent and Blunstone agreed, and contacted the band’s other surviving original member, drummer Hugh Grundy (guitarist Paul Atkinson passed away in 2004). Grundy quickly agreed to participate in a live performance of Odessey and Oracle. But Argent set the standard quite high: “It would be great,” he told his band mates, “but only if we reproduce every single note that’s on the original album.” O&O is a richly layered, multi-tracked album on a par with the Beach Boys’ Pet Sounds and the Beatles’ Sgt. Pepper, two other landmark mid-1960s records. Modern technology would make Argent’s goal possible. With a small coterie of auxiliary musicians (including White’s wife Viv on vocals, and Darian Sahanaja from Brian Wilson’s band), the Zombies prepared for the show. “We had a couple of rehearsals around the piano, and we had two days production rehearsal with Darian and everyone,” Argent recalls, “and that was it.” The show at Shepherd’s Bush in London was a rousing success, and the performance was released on DVD. Each show is split in two: for the first half, the ’60s lineup performs Odessey and Oracle start to finish. After a break, Argent and Blunstone return with the current-day band to play the Zombies’ other hits and newer material.